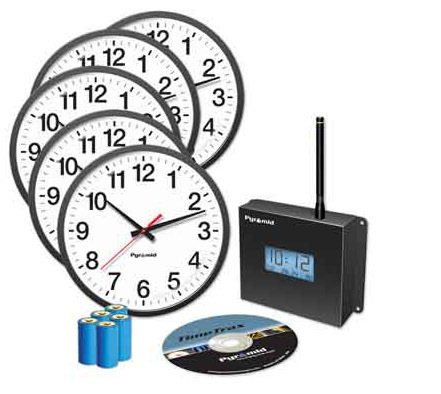 One Master Clock with software, 5 13" clocks with batteries. Add as many additional clocks as you need. Designed with plug-and-play connections for easy setup right out of the box. This solution captures time via the Internet NTP (Network Time Protocol) format or from the optional GPS satellite signals. Everything is guaranteed for 3 years. Add more clocks, digital and Analog, as needed! Connect to a PA systems with an inexpensive tone generator - ask us how - and alert people to shift changes, work start and stopo, breaks, lunch start/warning/end, class change, recess, etc. Affordable, easy to install, and available at Grainger for about 25% more! Run bells by adding the 5024 (24VDC) signal controller. The 5024 is connected to the master clock via a Pyamid BCB cable, then each bell connects to the 5024 by a standard 18 gauge speaker cable. Run up to 8 bells, or connect to your existing bells or intercom with one of our bridge devices. Call us, we can figure it out.